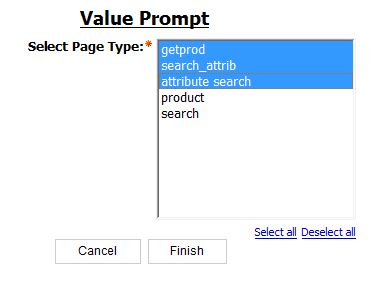 Value prompts are widely used in Report Studio Reports. Users want to validate the prompt values by limiting the number of values selected at a time. Users should be able to select only up to a maximum of 3 values. When the fourth value is selected, an alert message should be displayed. When one of the options is unselected, the "Finish" button will reappear and the alert message will be hidden. Create the prompt page and place an alert text as above. That should do the trick. Now when the user runs the report, they should see an alert when selecting more than 3 options. Is it possible if you can attach an XML as well? can you please explain clearly. this code is not working in 8.2.
what is the prompt name and alert text name we need to change in our report for this code.